I have a holistic approach to my patients and believe that not only organic disease can cause physical symptoms, but also non-organic disease. For this reason, I focus on the physical & emotional symptoms that could be contributed to the presenting complaint. 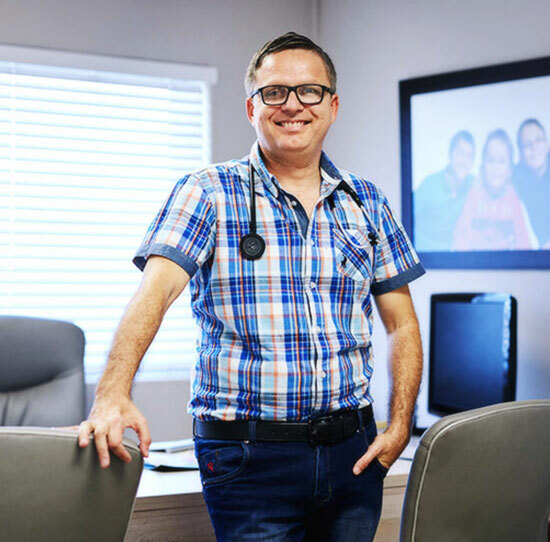 I have been practicing in Bellville (25 km outside Cape Town) since 1 June 2008, opening my Practice at the old Jan S. Marais Hospital, before moving into the new Melomed Bellville private hospital, when it opened in August 2009. After qualifying as a Specialist Physician in 2008, I broadened my expertise and knowledge to include a Diploma in Pain and Sedation, ICU Echocardiography, and a Bronchoscopy Course at the prestigious Royal Brompton College in London. I also hold a Master’s Degree in Psychology. To stay ahead of current trends and advances in the medical field, I regularly attend International Congresses. I have a keen interest in modern technology and employ all the latest technology for diagnostic and treatment purposes. As a 14 year old boy, I was diagnosed with Guillain-Barre Syndrome (GBS), an auto-immune disease that attacks the nerves of the body. In spite of this, I am a firm believer in the idea of rising above your circumstances and this life-changing event has shaped my future, to become a compassionate Physician. The wellbeing of my patients is of utmost importance to me. I do not compromise on the quality of care of my patients. I use my experience with GBS, to put my patients at ease with a good sense of humour, comprehension, consideration, compassion, and respect for my patients and their families.